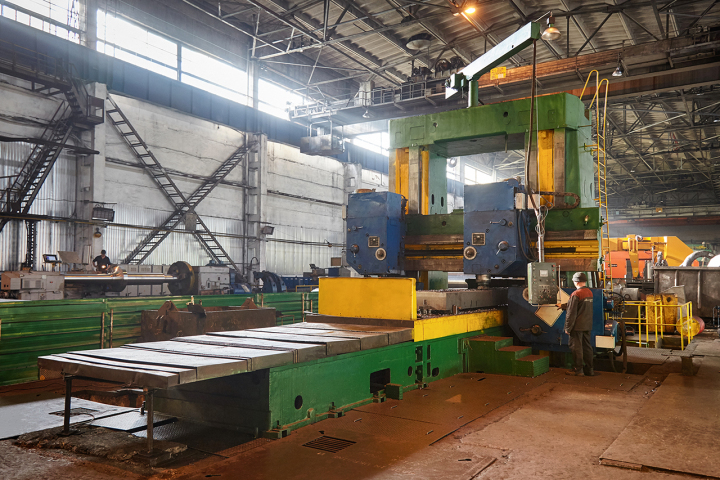 In the metallurgical accessories shop of PJSC “Energomashspetsstal” a new peripheral milling machine model 6620 has been put into operation. Assembly and installation and adjustment of equipment were carried out by specialists of the plant and employees of LLC “Ukrmegastroy”. Currently, the commissioning of the machine has been completed. The peripheral milling machine began to implement the production program. The peripheral milling machine model 6620 is designed for processing the surface of steel products with weight up to 50 t. In comparison with the previous, the recently installed machine has significant technological advantages. The new equipment makes it possible to improve the quality of the processed blanks, to reach a new level in the accuracy and complexity of machining of parts, to shorten the processing time of products, which as a result will lead to increased labour productivity and the expansion of the product range. Also, local lighting fixtures are installed on the machine, which has importance in terms of compliance with the rules and norms of occupational safety and health. A considerable share in the installation and adjustment of the new machine was made by the MRS milling machine operator Nikolai Suslov. After working for more than a year on the previous machine, he was able to offer a number of valuable recommendations. “The machine has proven itself in the work as a productive and reliable technological equipment” – says MRS milling machine operator Nikolai Suslov.